Red chili pepper flake ("Gochugaru" in Korean) is one of the key ingredients in Korean cooking. It cannot be replaced with chili flakes or sauces from other cultures when cooking authentic Korean food. Koreans select their red chili pepper flakes carefully because it is possible to get unclean and unsafe materials in the flakes during the production process. 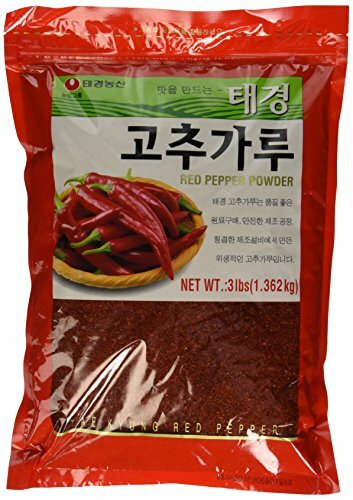 Many Koreans source their red chili peppers directly from a farm they personally know, or purchase from a reputable company. The color is bright red. This is a decent product if you are looking for more affordable red chili flakes. If you have any questions about this product by Tae-kyung, contact us by completing and submitting the form below. If you are looking for a specif part number, please include it with your message.